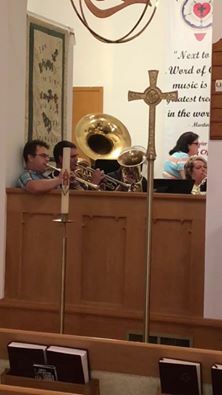 It Takes a Lot of Brass – Our Saviors in Cavalier, North Dakota | "Northern Crossings"
This is not a very good picture but…. it is a picture of Our Saviors Lutheran in Cavalier and last years Reformation Hymn Sing. One of my special memories is the sound of a brass Quartet playing in the Quad at Concordia Seminary with the oak leaves that hadn’t fallen clinging to the trees in a small breeze. It was getting toward evening and there was a chill in the air but the sound of “A Mighty Fortress” played with a trumpet, coronet, trombone and tuba was a real treat. It gets chilly in St. Louis in October but my memory was of a rather pleasant temperature and the feeling that the music could play well into the night. Concordia Seminary is built to look like a medieval town in Germany and the effect of the music and the evening and the light and the trees was evocative. The Reformation made the Lutheran Church the “Singing Church” and Luther’s love of music is well known. “I have made fun of Lutherans for years – who wouldn’t, if you lived in Minnesota? But I have also sung with Lutherans and that is one of the main joys of life, along with hot baths and fresh sweet corn. for their secret fondness for macaroni and cheese. But nobody sings like they do. Lutherans they’ll smile and row that boat ashore and up on the beach! And down the road! Lutherans are bred from childhood to sing in four-part harmony. It’s a talent that comes from sitting on the lap of someone singing alto or tenor or bass and hearing the harmonic intervals by putting your little head against that person’s rib cage. It’s natural for Lutherans to sing in harmony. We’re too modest to be soloists, too worldly to sing in unison. When you’re singing in the key of C and you slide into the A7th and D7th chords, all two hundred of you, it’s an emotionally fulfilling moment. I once sang the bass line of Children of the Heavenly Father in a room with about three thousand Lutherans in it; and when we finished, we all had tears in our eyes, partly from the promise that God will not forsake us, partly from the proximity of all those lovely voices. By our joining in harmony, we somehow promise that we will not forsake each other. So like “Minnesota Nice”, choral singing and brass bands seem to be disappearing so Our Saviors should get a lot of credit for having the brass to get a band together and they have more than a quartet. The members of the band are Leslie Augustine, Greg Kemp, John Dunnigan, Jeremy Morrison, Tim Unke, and Pastor Mark Chepulis who plays the saxophone. That makes a sextet and that is a lot of brass. So come to Our Saviors in Cavalier at 7pm on October 28 for a Reformation Hymn Sing with a brass band. Common Worship of a Delightful God. Thank you for the post! We are looking forward to seeing everyone there!